All of our properties are located in quiet, residential neighborhoods. Properties have off-street parking and ample storage space. Most units come with laundry hookups, and all properties are conveniently located on bus routes. All of our units are lead-safe. Eligibility is based on income. As a not-for-profit entity, the Auburn Housing Authority must use all rental income to maintain operations and improve properties. We utilize income from rents to provide 24-hour maintenance service, maintain a management office on-site, and continuously improve our units. Safety is our top priority. We actively participate in the City of Auburn’s Community Policing Program. To apply for housing, you must complete an application. You can download an application by clicking on the APPLY tab above and choosing the complex that you want to apply for. You can request that an application be mailed to you from this website by clicking on the CONTACT tab. You may also call the office between 8am and 4pm to request that an application be mailed to you, or you can stop by our main office at 7 Merriman Street, Auburn, NY, to pick up an application. 1. You must meet specific income guidelines for all properties (low to moderate income levels). During the application process, the AHA will review family income, assets, and family composition to determine eligibility. 2. In general, AHA requires at least six months of positive independent rental history, but other options may apply. Living with friends or relatives DOES NOT count as independent rental history. 3. The Head of Household must be at least 18 years of age or older. 4. You do not have to be a citizen; however, you must have eligible immigration status. Non-citizens with eligible immigration status will be required to provide proof of eligible immigration status. 5. You must complete an application completely. If you have applied in the past and been denied due to an unfavorable rental reference, you must wait two years to reapply. 6. Applications will not be accepted from applicants who owe the Auburn Housing Authority or another Housing Authority money until what is owed is paid. For Federal Programs (Olympia Terrace and Section 8 HCV) if your name appears in the Debts Owed to PHA’s and Terminations database, you will have to wait 3 years from the date of termination to reapply. Can I get an apartment if I have a felony record? Criminal history is evaluated on a case by case basis. It is always best to apply and find out. The application process can take up to six weeks. If your application is accepted and we do not have units available, you will be placed on a wait list. Currently, we have waiting lists for all our complexes, but we encourage you to apply as the waiting list is updated regularly. What are the differences between Melone Village, Brogan Manor, and Olympia Terrace? Melone Village is regulated by the New York State Homes and Community Renewal. Brogan Manor and portions of Melone Village are regulated by the Low-Income Housing Tax Credit (LIHTC) and HOME Programs. Olympia Terrace, the Housing Choice Voucher (Section 8 ) Program, and Merriam Circle are regulated and subsidized by the U.S. Department of Housing and Urban Development (HUD). Utilities at Melone Village and Brogan Manor are included in the rent. Excess utility charges may apply if you have a washer, dryer, air conditioner, additional refrigerator or freezer, or aquarium. Utilities at Olympia Terrace are not included in the rent. Residents of Olympia Terrace must contact NYSEG and have the utilities set up in their own names. Residents will then receive a “utility allowance” that is deducted from their rent payment. Where is the office located? Where are the apartments located? Our office is located at 7 Merriman Street, Auburn, NY, 13021. Melone Village is located at 7 Merriman Street, Auburn, NY, 13021. Brogan Manor and Olympia Terrace are located on Olympia Avenue, Auburn, NY, 13021. Olympia Avenue is off of State Street. Do you have any handicapped-accessible apartments? 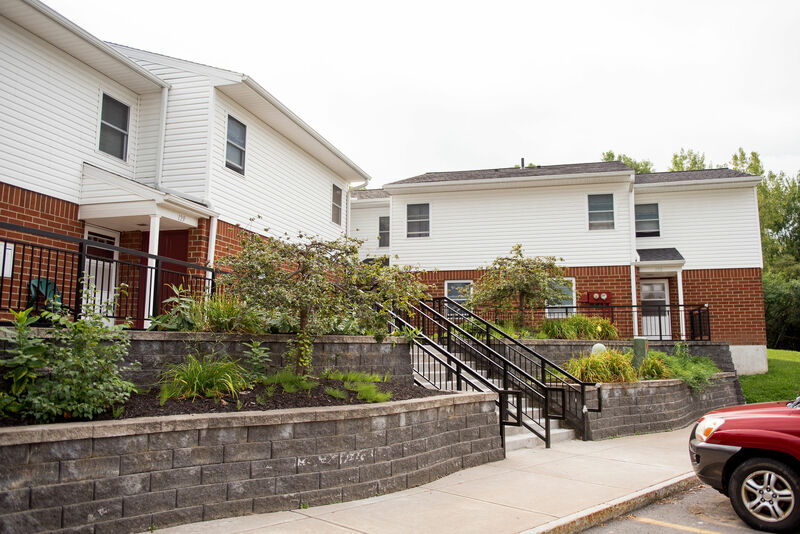 Olympia Terrace has three handicapped-accessible units. 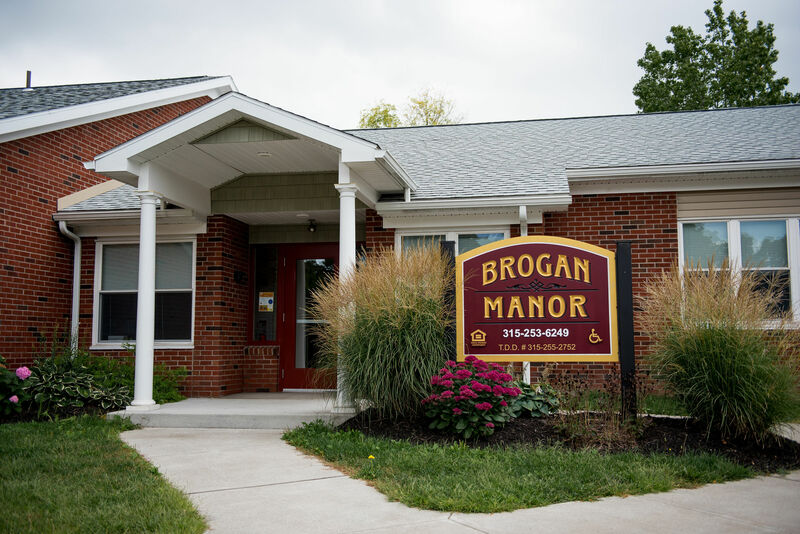 Brogan Manor has five handicapped-accessible units and five audio-visual equipped units. Melone Village* currently has four handicapped-accessible units 3 audio-visual equipped units. 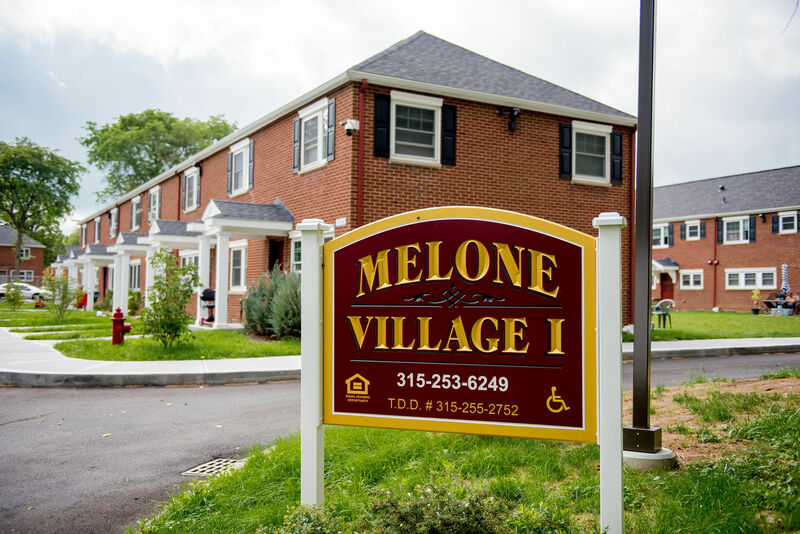 *As renovations at Melone Village continue, additional handicapped-accessible units and audio-visual equipped units will be added. Residents of Melone Village and Brogan Manor are permitted to have fish tanks (aquariums may incur an excess utility charge) or birds (birds must be caged). Cats, dogs, and ferrets are NOT permitted at Melone Village or Brogan Manor. Residents of Olympia Terrace must adhere to a very strict Pet Policy. Residents are permitted to have one cat OR one fish bowl or tank OR one cage with no more than two birds. Residents can have one type of pet. Dogs and ferrets are NOT permitted at Olympia Terrace. All pets must be registered with management. Cats require a $300 security deposit. Cat owners are required to pay a fee of $5 per month. ALL cats must be spayed or neutered. Can I rent an apartment if I am single? What size units are available at each complex? Melone Village has 1-bedroom, 2-bedroom, 3-bedroom, and 4-bedroom apartments. Brogan Manor has 2-bedroom, 3-bedroom, and 4-bedroom apartments. Olympia Terrace has 2-bedroom and 3-bedroom apartments. Is it safe to live in the complexes? Safety is our top priority; all of our properties are safe. Each tenant is given the phone number of our Community Policing Officer at the time of move-in. During the daytime hours, we have staff on-site at both complexes. We work closely with the Auburn Police Department to ensure that tenants receive services in a timely manner and to ensure that a police presence is maintained in and around our complexes. 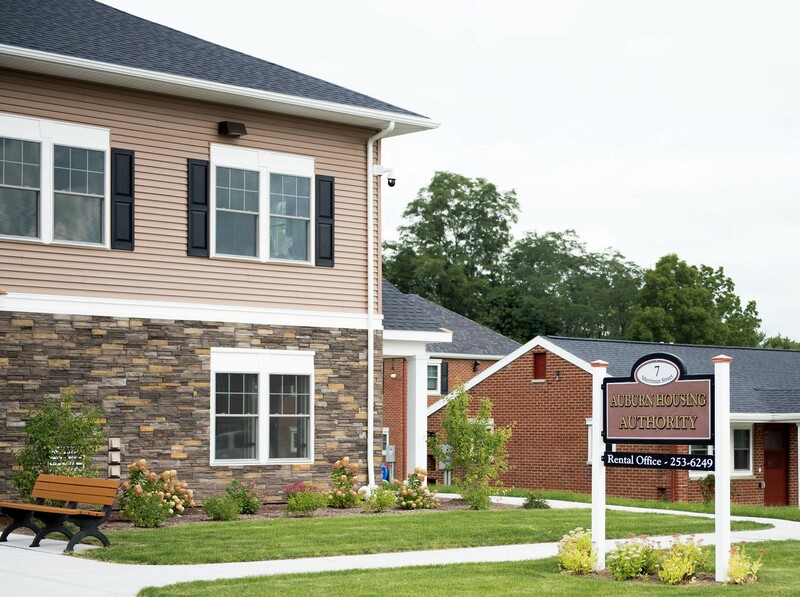 Security cameras are installed at Brogan Manor, Melone Village, and Merriman Circle. Calls for service have dropped dramatically since the late 1990s. Does the Auburn Housing Authority provide emergency shelter/housing? The Auburn Housing Authority does not provide emergency shelter. All applicants must go through the application process and meet the eligibility requirements in order to be admitted.